finding ways to live a more connected, healthier and sustainable way of life. Wivenhoe is a town of around 10,000 people on the River Colne in Essex, UK. 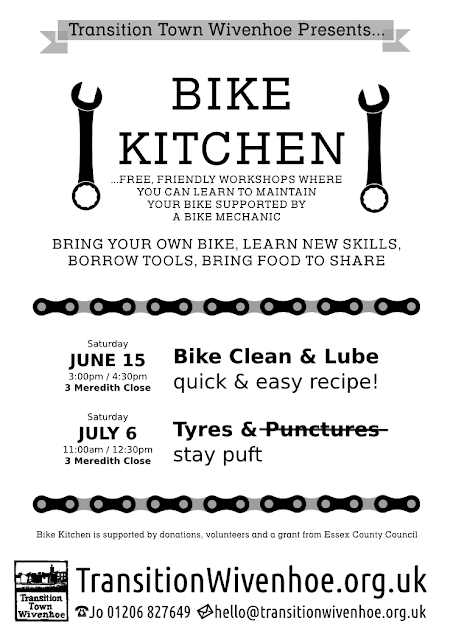 This Saturday at 3:00pm Bike Kitchen will cover cleaning and lubing your bike - what to clean, where to put oil and where not and how to do it all quickly and easily. It's a friendly workshop with tea and cake and suitable for different ages and all sorts of skill levels. Thanks for the amazing tea and cake Jo... and of course Jason's valuable lesson in chain lubing! I hope to see you at the next session on 6 July. You are very welcome Janine - thank you for taking the chance and just coming along, and for your tasty food contributions too :) We hope to see you at the next one.